For anyone who figures out the two (2) meaning behind tonight's blog entry I will award you a free jenandnate.blogspot.com T-shirt*! Today is Tuesday and, as per routine, I picked up the ninth week of our farm share. 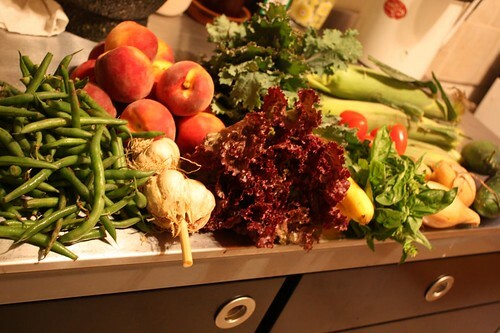 This week included: green beans, Juliet tomatoes, cucumbers, onions, sqaush, lettuce, basil, garlic, kale, corn, and peaches. 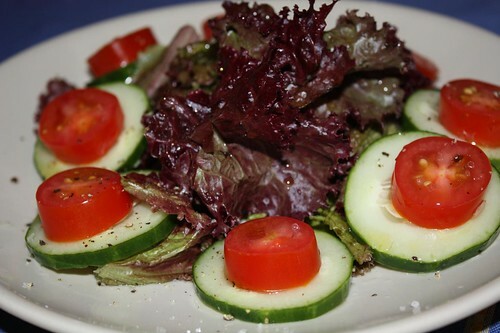 I used the Juliet tomatoes, cucumbers, and lettuce to make this salad. Of course I made a cucumber-free version for myself as readers will already know I would rather dine on any number of unspeakable internal organs than feast upon a single cucumber. The Juliet tomatoes were good but not quite as good as they were last year. This is undoubtedly due to the biblical rainfall we have received this summer. For the main course I did something a little strange. Braised cabbage is not generally known as a summer dish. 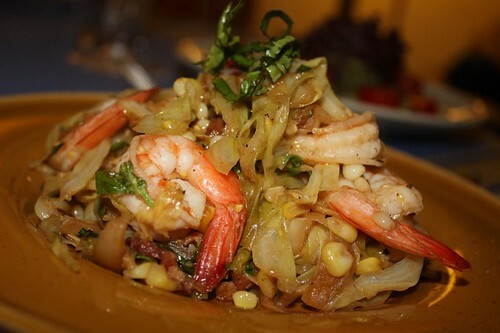 However, since the cabbage from last week was still kicking around I decided to braise it with some garlic, onion, bacon, cayenne, shrimp, corn, basil, and lemon juice. While it seemed strange I can honestly say this is one of the best impromptu meals I have ever made. I was so happy with this result that I wished I'd written down the exact quantity of everything I used for future reference -- something I never do. Given that ingredient list I should hopefully be able to duplicate it again in the future. 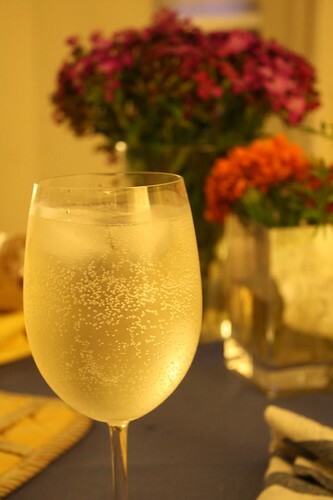 For a beverage we had one of Jen's favorites: white wine spritzers! I usually let Jen enjoy these by herself but it seemed like a perfect night for me to partake as well. Besides, it's been a while since I've had girly drinks so tonight seemed like the perfect opportunity to get back in the game. *T-shirt does not actually exist but we will allow you to create your own without legal repercussions!